Honest, I’m not a godless Communist, but at this moment I have not taken a single animal with the 6.5 Creedmoor. Daughter Caroline shot her first buck with a Creedmoor. Yesterday, on our “coast zone” opening day, my wife, Donna, shot a gorgeous blacktail with a Mossberg Patriot chambered to this seemingly magical cartridge. Me, I’ve punched a lot of paper and rung a lot of steel with this amazingly popular cartridge, but I’ve drawn no blood with it. Mostly this is for lack of effort. Several test rifles in 6.5 Creedmoor have been to the range and have been written about and returned, but I’ve spent few days in the field with it. Maybe, deep down, I really am a Communist agitator, because I have not yet owned a 6.5 Creedmoor rifle. There are two in the safe right now, that Mossberg and a Savage 110 Storm. Maybe I’ll write a check for one of them, but right now it’s deer season. This is an “unleaded” zone, so the Mossberg is zeroed with Federal 120-grain Trophy Copper. So, hopefully, I’ll take my first animal with the 6.5 Creedmoor. 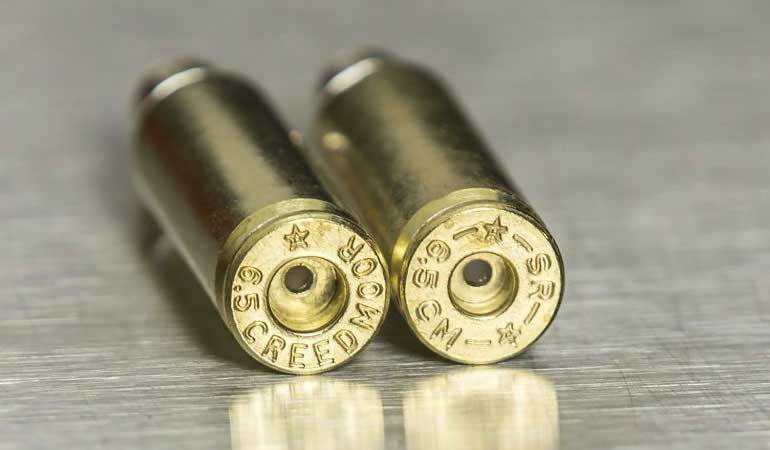 The 6.5 Creedmoor truly is a marvelous little cartridge—efficient, effective and accurate. However, I continue to be astounded by the childlike faith in which it is held and the almost mythical properties currently attributed to it and its .264-inch bullet diameter. This is not the first time the 6.5mm has come to center stage. The 6.5mm was in the middle of the small versus large caliber debate at the beginning of the previous century. C.H. Stigand (1877-1919) was possibly the most outspoken smallbore fan, and his advocacy of the 6.5mm in his Hunting the Elephant in Africa (1913) did much to fuel the debate. Stigand’s contemporary, Walter Bell (1880-1954), is known for the 7x57, but he also used the 6.5mm. Bell’s final word on the subject, written for American Rifleman shortly before his death, was that the 6.5mm’s 156-grain solids were too long and slender for caliber and tended to bend and deflect. In America we weren’t too concerned about solids for pachyderms, but early 6.5mm military cartridges gained a significant foothold over here. The 6.5x54 Mannlicher was popular a century ago, but only the 6.5x55 Swedish Mauser still has a consistent, if limited, American following. In 1958 the .264 Win. Mag. was the first 6.5mm cartridge from a major American manufacturer. Initially the .264 took the market by storm and seemed destined for greatness. It fizzled quickly, and no other American 6.5mm cartridge has gone anywhere—until the 6.5mm Creedmoor. The Creedmoor’s marketing trajectory is unique. Introduced in 2007 as a long-range target cartridge, it languished for several years. Then, almost inexplicably, sales took off, and they keep climbing. It is today’s hottest seller; everybody wants one or already has one. Ammo sales are through the roof, and if you aren’t yet on the Creedmoor bandwagon, well, you must be a Communist. Or worse. Developing 2,700 fps with a 140-grain bullet, the 6.5 Creedmoor offers mild recoil, yet remains supersonic to extreme range (about 1,200 yards), ideal for long-range target shooting. It is ballistically identical to the less popular .260 Rem. (1997) and the 6.5x55 Swede (1891) and is not better nor worse than either. It does have the design advantage of a shorter case so it can handle long bullets in short actions. Otherwise it has no supernatural properties. There is much one can do with a 140-grain bullet. One of our younger pundits similarly took an eland with a 6.5 Creedmoor and a 140-grain bullet, commenting that it seemed plenty adequate. I don’t know if he felt the same way when, shortly thereafter, he lost an elk to the same cartridge and bullet. Field experience on game animals of varying sizes comes slow and takes many years. Another good young writer with solid tactical and target credentials but little hunting experience told me he’d be confident “taking elk to 400 yards with the Creedmoor.” This frightens me. The 6.5 Creedmoor is a wonderful long-range target cartridge, accurate and easy to shoot. It is not an equally wonderful long-range hunting cartridge, especially on game larger than deer. Residual energy just isn’t there. On game, 140 grains is plenty, but with its modest velocity the 6.5 Creedmoor is not as potent as the faster .270 Win., nor as powerful as any of the fast 7mms from .280 Rem. upwards. Maybe. With its modern case design it will be accurate, and it’s designed for long, heavy-for-caliber bullets. However, its ballistics are identical to those produced by the .264 Win. Mag., introduced in 1958. As a kid I had a .264 and thought it was magic. I know today it was not, but it was a solid performer on western big game at fairly long range. With today’s great bullets, the .264 is a better cartridge now than it was in 1958. The PRC will be just as good. It may be, on average, a bit more accurate, and it may digest heavier bullets better. But it does not have supernatural powers and, as a hunting cartridge, is unlikely to be “better” than the .264. I still have a .264, and although I’m in the small cadre of its fans, I still like it. Come to think of it, I also have a 6.5-300 Weatherby, which projects a lot more energy farther downrange than either the .264 or the 6.5mm PRC. With good bullets and proper shot placement, I have no qualms considering the 6.5mm PRC and the .264 sound 400-yard elk cartridges. In the purest theoretical terms, I suppose the .26 Nosler and 6.5-.300 Weatherby could extend that distance, although I’d prefer heavier bullets with more frontal area (meaning larger calibers) for elk-size game at longer ranges. However, since I don’t yet have a 6.5 Creedmoor, you guessed it, I also don’t own a 6.5mm PRC. Maybe I will, but I’ll probably go along with the crowd and have a 6.5 Creedmoor before I give up my .264. Meantime, it’s late afternoon, my tag is in my pocket, the Mossberg is in the truck, and it’s time to go hunting. Maybe tonight I’ll be introduced to 6.5mm magic. I doubt it, but if I do my part I’m pretty sure the 6.5mm Creedmoor will work just fine.